I grew up in Cabot, Vermont, surrounded by dairy farms. When I was a kid, my parents grew pansies and sold them wholesale to farm stands. As soon as we were old enough, they had me and my brother out in the field transplanting, boxing, and watering. They also planted an enormous garden, and I remember my brother and I being told to “go graze” when we asked for a snack; we would eat dirty carrots and freshly shelled peas for hours. Once I started working, I had a million different jobs. I always loved working with my hands and being creative, and I went to art school. But after floating around doing different things, I went to New Zealand and WWOOFed (World Wide Opportunitie on Organic Farms) for half a year, and it reminded me how much I like the dirt. When I came home, my dad and his partner decided to turn the old homestead into a farm again, but vegetables this time. I moved back to a little house next door and helped get things off the ground, then migrated to the Rochester area, where I worked at Peacework Farm for four years. I fell in love with the CSA model. I love knowing the people I’m feeding and having that direct connection to the community around me. 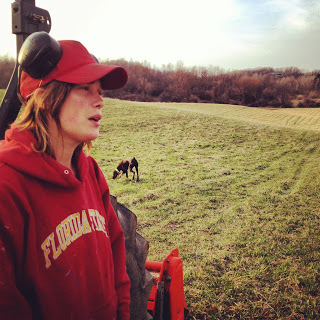 In 2013, I started working at Mud Creek as Farmer Erin’s assistant manager. I learned a whole lot from her, and I’m proud and humbled that she thought me ready to take over the farm when she decided to leave for further adventures. I was excited to take the reins and do my very best to make Mud Creek Farm an integral and valued part of the community. While Erin was deciding to leave the farm, the farm was also leaving at the same time. The piece of land that Mud Creek started on was being sold out from under us, so we spent a lot of time in 2013 looking for new land. We finally found the right spot on Cherry Street in Victor, NY. The transition has been difficult at times, but each year our home on Cherry St. feels more comfortable and supportive, as we shape the raw weedy landscape into a thriving farm. Hi Ruthie, so good to see you all are doing well. Can’t wait to see it in person this summer.